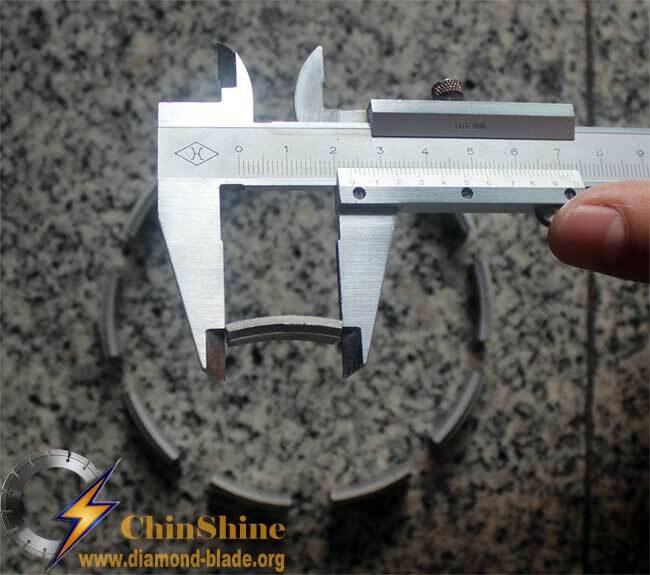 ChinShine Diamond Core Drill Segment is made of quality diamond crystal, Cobalt Powder and metal powders, develop new and sepcial formula to make sharp & fast drilling segments. It is designed for cured concrete, especially for hard aggregate armoured concrete which contain heavy steel. Faster drilling -- The single-pointed segments(roof shape) provide incredibly fast drilling speeds. Fast seating and reduced vibration -- The roof shape tips penetrate quickly, and hold a straight drilling path to reduce side drag. Reduced vibration improves drilling efficiency and bit life. Improved cooling and slurry removal -- The roof diamond segments increases water flow to reduce heat and removed slurry more efficiently. 1. For Wet drilling,reinforced concrete,Constrction work and Different hardness concrete slabs. 2. For fix up air-condition,Drilling hole in wall,ground,floor,drainage pipes etc. 2. Use water when drilling, high temperature lower the performace and the segments may drop. 3. Power drilling machine is recommended. 4. Lower speed if drilling thick and high strengh cast iron.